Early Start. Crews go to an early start on the beach below 320 Esplanade. Judging by the way the building shook, they were moving a terrific amount of rock but since I didn’t see activity down at the rock staging area by Chit Chat Cafe, I guess they were repositioning and tightening up the boulders already there. Were they taking advantage of a low tide before the storm hit? Not sure but that’s my guess. Days Missing – ??. On Thursday we heard that a decision regarding the fate of 330 Esplanade might be released shortly. (See my notes from 1/14 below). Curiously though, more than a week ago KTVU reported that owners and engineers would meet and we’d get a decision “early in the week” – say Monday or Tuesday 1/11 or 1/12. Some sort of meeting did happen, since the work on 310 and then 320 was approved. What happened with 330 Esplanade? Don’t know. Speaking of the storm. MARINE WEATHER STATEMENT. This is in addition to the prodigious predicited rains… 4 or more inches in most areas to and 10+ inches in the coastal mountains (see Hydrologic Outlook). 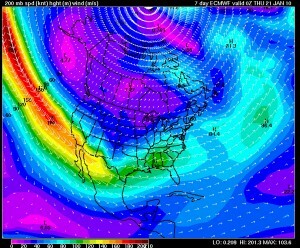 HELP TO DIRECT A LARGE SWELL WITH A LONG FETCH TOWARD THE COAST. FORCE WINDS IN EXCESS OF 35 KT THROUGH OUT THE WEEK. 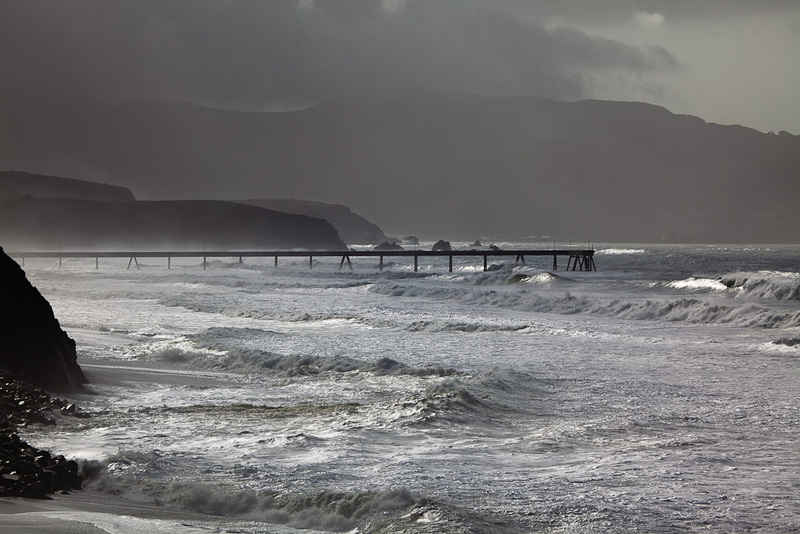 Current tides at Ocean Beach. This chart should always be up-to-date. Click the graphic to go through to the originating site, Surf-Forecast.com, where you can get a lot more information about surf, weather, winds, etc. Good site. The crane moved north on Esplanade this afternoon and at this hour is flying rock over the “dog park” and down to the beach at the corner of 310 Esplanade. 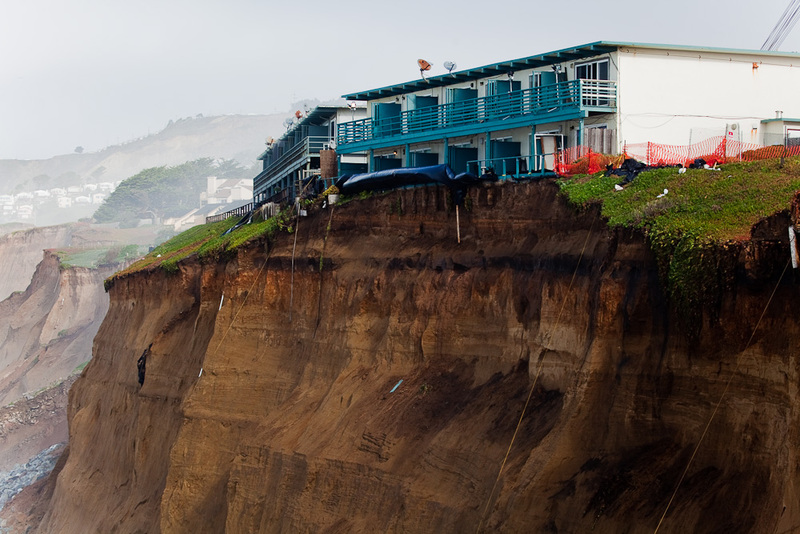 Good video and info at KTVU.COM, New Problem Emerges At Crumbling Pacifica Cliff. This post could also be called “No easy answers for Esplanade Ave”. At least I don’t know them. 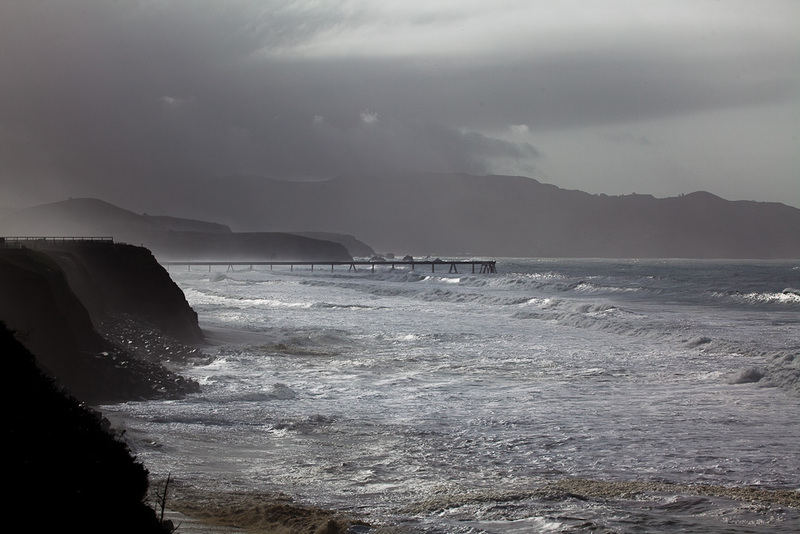 During the course of monitoring the surf-caused erosion behind the buildings along Esplanade Ave in Pacifica, engineers noticed a new problem. 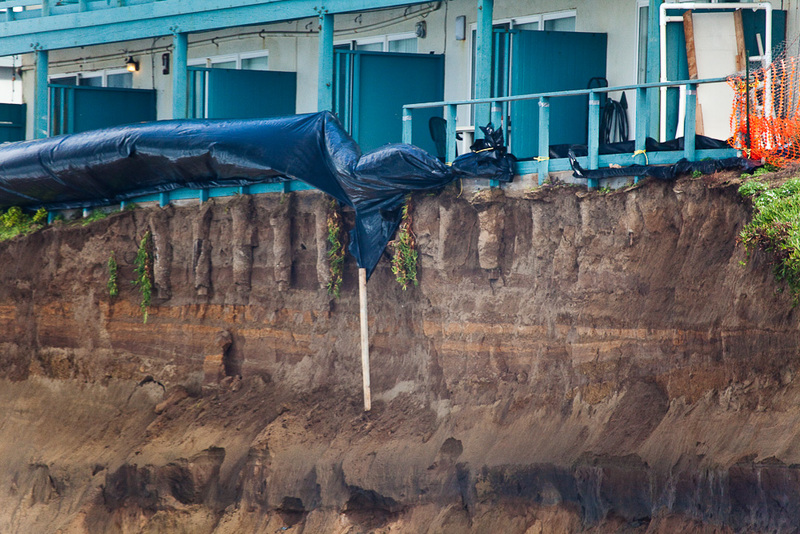 A substantial amount of dirt had fallen away from the northwest corner of 310 Esplanade, and with new storms on the way, the problem would only get worse. Unfortunately, this problem was predictable and should have been prevented. Still worse, solving this problem may just cause it to recur near by. The short-term solution for 310 Esplanade was to armor the base of the bluff with rock rip rap as a temporary seawall. Luckily, or as the result of prudent planning, engineers still had a huge red crane standing by so they drove it north up Esplanade, planted it in place, and began using it to fly rock over the “dog park” and down to the beach. The crane is much slower than dump trucks and excavators, but the crane can operate safely during high tides and at night. Presumably, if crews can extend the existing temporary rock and sand road far enough, they will use it to move rock in the morning. 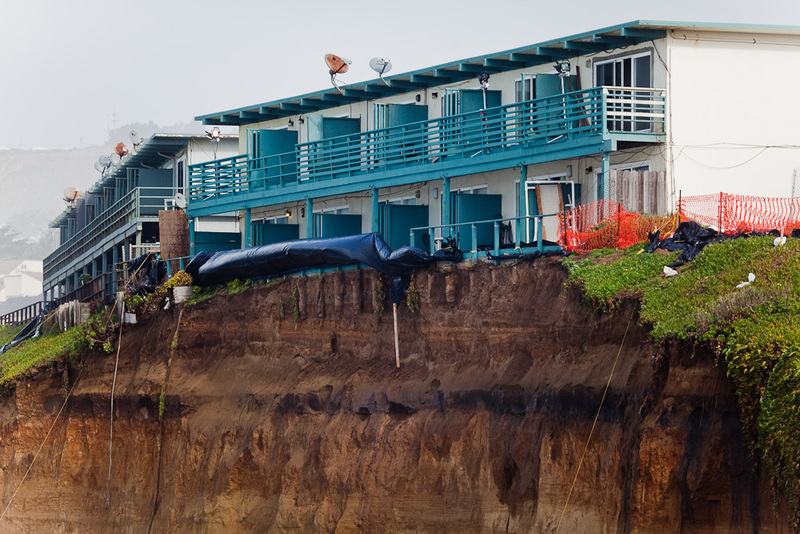 There’s been a long term solution – a low, permanent seawall at waters edge and stitch piers at the top of the bluff – before the Coastal Commission for some time, and owners had planned (hoped) to have that work done in summer 2010. Note that last week virtually the same problem arose at the south end of 320 Esplanade, at the end of the existing rip rap seawall. The solution was the same, and despite the recent storm there has been no further erosion. Second, the implications for the residents of 310 Esplanade. building up and extending the rip rap seawall at the base of the bluff should halt the surf erosion, at least for this winter, and residents should be able to stay. 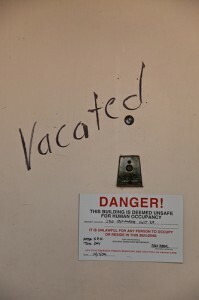 residents in 310 Esplanade may want to stay alert, but may not need to move. If I lived in 310 Esplanade, I would not move – at least not yet. Third, an incomplete rip rap seawall. And here is today’s image of 310 Esplanade from the KTVU.COM story. It’s easier to see in the video on the KTVU site that bluff top has fallen away just beyond the end of the rip rap. Fourth, how this was predictable, preventable erosion. 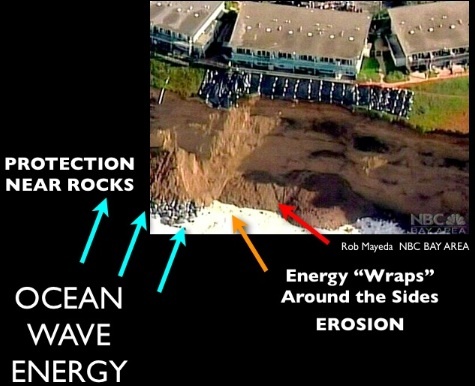 In my post Crumbling coastline: Pacifica’s problems nothing new to the California coast (12/20) I linked to a post with the same title by KNTV meteorologist John Mayeda on Examiner.com. After the major collapse of the bluff behind 330 Esplanade on December 17th action could have been taken to prevent the two significant falls behind 320 Esplanade on January 3rd, and 310 Esplanade on January 13th. In both cases quick work seemed to halted further falls, and for 320 Esplanade at least, prevented erosion during a substantial storm. It seems possible that equally small, quick efforts would have prevented the additional falls entirely. After last night’s waves and rain died down I got out and grabbed some photos of the current state of the bluff behind 330 Esplanade. The full height (depth?) of the pilings or piers supporting a retaining wall beneath the patio are clearly visible. I’d guess they are about 1/3 exposed at this point. In addition, I clearly saw (and captured) a fresh but fairly unimportant dirt fall. It is hard for me to imagine how the building is to saved at this point, but if the owners come up with the money I guess it could be done. Note that as far as I know, the expense for all work since the first big fall on December 17 has been borne by the owners – nobody else. Wednesday 01/13/10, 9PM. Real problems now behind another building, 310 Esplanade. 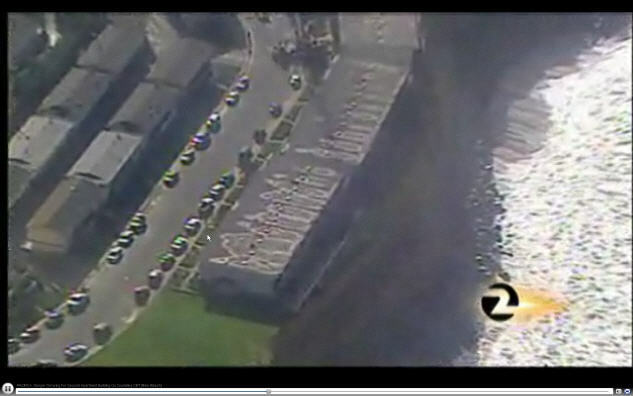 Good video and info at KTVU.COM New Problem Emerges At Crumbling Pacifica Cliff. I had a hard time accepting that the bluff fall behind 310 Esplanade Ave was a surprise, so I wrote a post to explore the issue: Predictable, preventable erosion behind 310 Esplanade. 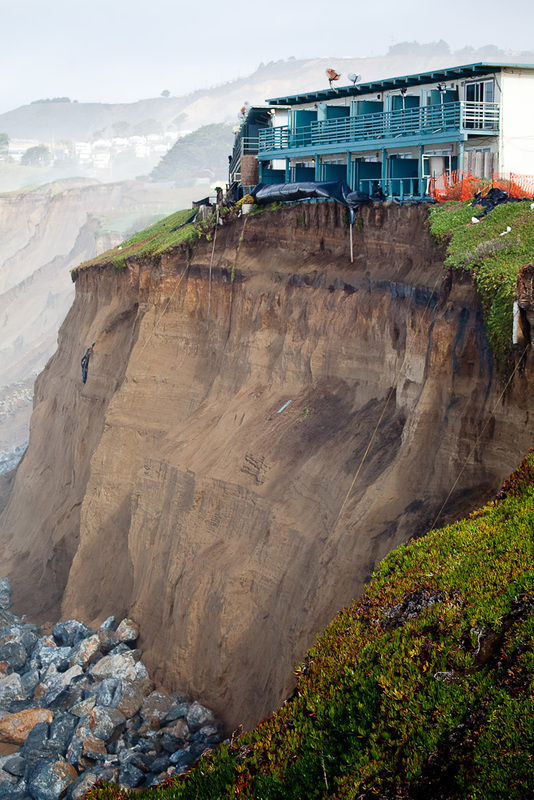 KGO-TV 7 Erosion causing new concerns at Pacifica cliff. Engineers were called in Wednesday morning by the building owner to assess the erosion under the apartment building at 310 Esplanade. My own January Behind 330 Esplanade – Photo Gallery shows the erosion at the rear foundation of 330 Esplanade. SFAppeal.com High Surf, Coastal Flood Advisories Lifted …warnings went into effect at 10 p.m. Tuesday and were expected to last until 4 a.m. Thursday for all the coastlines in the region, but wave heights dropped below 15 feet this morning, prompting weather service officials to cancel the warnings. Wednesday 01/13/10, 10AM. Continued waiting. owners’ decisions on what will happen next. See below and my post After the Initial Crisis, Questions about Direction and Cost. weather. The high surf warning remains in effect, but somewhat lower waves have been observed at off-shore buoys and stormsurf.com. Heights in the 13′ to 18′ range have been reported and even at the predicted 6.4 high tide seem to be at or below the height of the rip rap. owners’ decisions on what they’ll do next for 330 Esplanade. According to Steve O’Connor of Engineered Soil Repairs (January 6th): “they can’t just leave it unrepaired because it’s going to threaten the neighbors and the road. They do have some responsibility to prevent this from impinging on others.” See my post, After the Initial Crisis, Questions about Direction and Cost. weather. Various media reports but this was the best: KGO TV, ABC7. 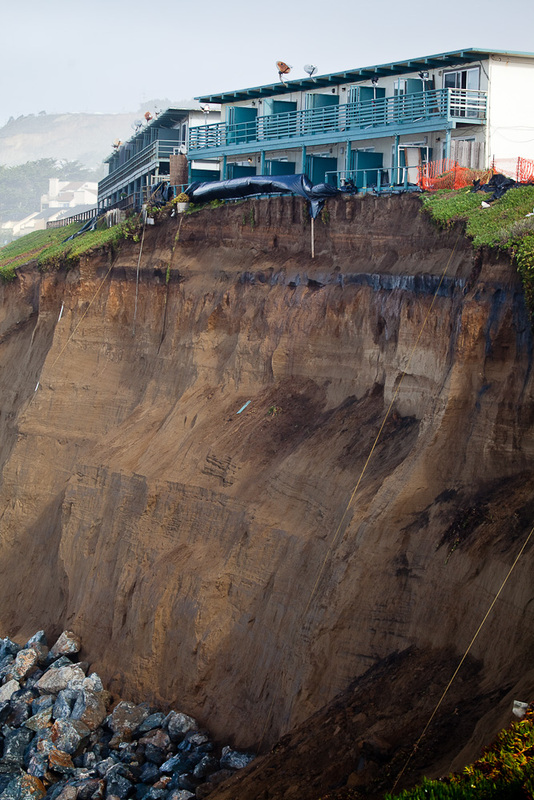 Storm prompts urgent repairs on Pacifica cliff. See the piece for current pictures and context. Most interesting to me were these quotes from Project superintendent Tony Fortunato of Engineered Soils Repair: “We’re going to tune up what we have down there, try to raise rock up and get it around 30 feet high, its about 22 to 25 feet,” said Forunato. 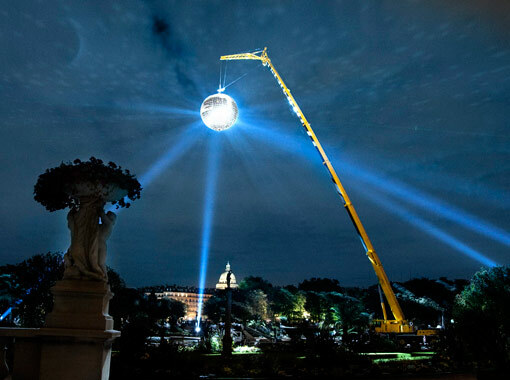 “We’ve got the crane onsite. If we got any dire need like we did last time, we can always start throwing rock over the building again. If we can’t get on the beach, that’s another option, but hopefully we’ll be able to tune it up enough to weather this storm — that’s the hope,” said Forunato. 10 PM THIS EVENING TO 4 AM PST THURSDAY. A COASTAL FLOOD WARNING MEANS THAT FLOODING IS OCCURRING OR IMMINENT. MAY ALSO LEAD TO AREAS OF BEACH EROSION. There will be huge waves at Mavericks Wednesday, but the forecast winds and weather made the surf competition hold out for better conditions. 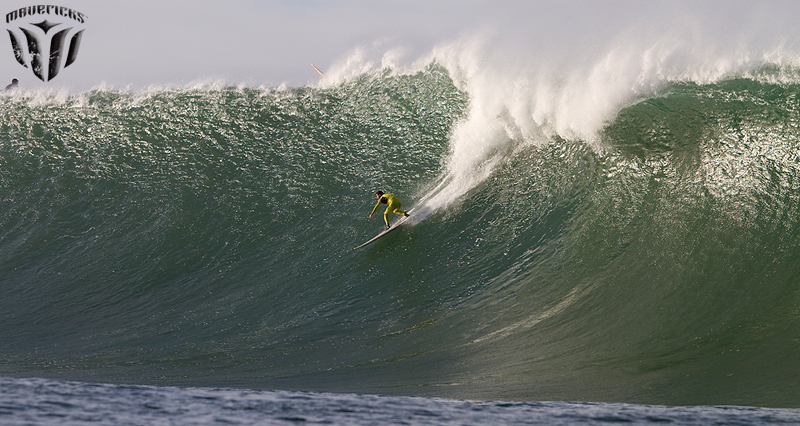 Click the picture for a wave from Sunday and see the Mavericks Surf website for a photo gallery. 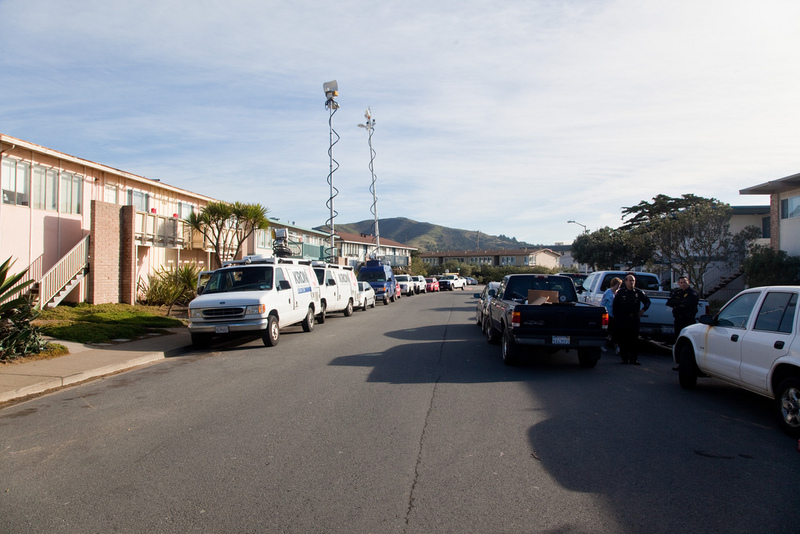 Finally: KGO-TV 7, Residents visit threatened Pacifica apartment. Folks were given a few minutes to retrieve the last of their belongings. Resident report that more dirt fell last night from the bluff on Esplanade, but I don’t have a clear idea of the location. UPDATE: no other confirmation of this… it might have been a delayed reaction from Sunday. Nice clear description of the most ambitious / expensive repair plan in this KPIX CBS5 TV report Engineers Work on Saving Pacifica Cliff. After a slow start, the piece has nice video and archive pictures that show the huge loss of the bluff to erosion.